As I spritzed out my last spritz of the this work pillow spray last night, I wondered what else I had finished recently. I last did this post almost exactly a year ago – see it here. I have ‘hit pan’ on 4 other products recently, which is exciting. I always find that finishing products (or nearly finishing them) shows how much you lurve them. Aside from the deep sleep pillow spray, I also recently finished my Emma Hardie cleansing balm and I will be repurchasing soon, when i’ve worked my way through some cleansers I have lying around. 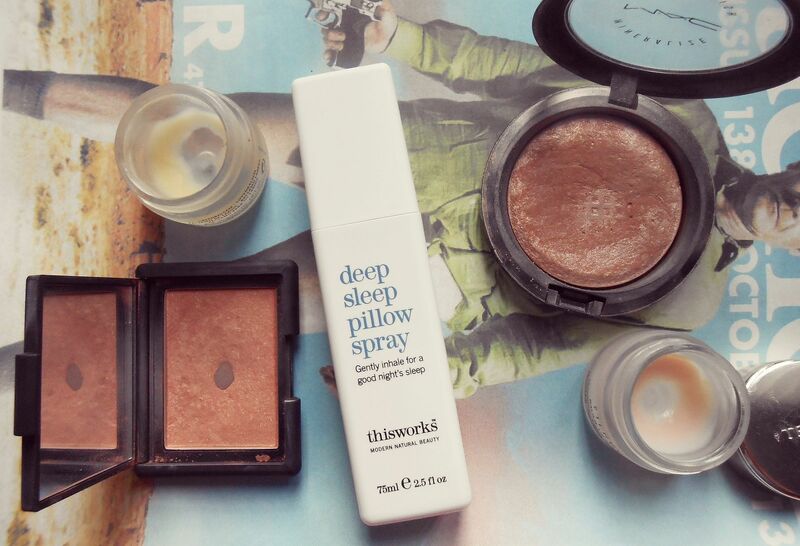 I loved the pillow spray, I use it every night in my little routine. I’m like a toddler, I like to have a bed routine. It’s fairly… extensive, shall we say, but the pillow spray dowses my pillow and my blankets. I would repurchase, but I have the Avon one which smells really similar and is cheaper. I’ll report back. I’ve hit pan on my two favourite lip balms ever, which makes me sad. I have a back of the Nuxe Reve de miel, which is great for keeping in my bag throughout the day. I know it’s a pot – squeal – but it’s so nourishing, and the matte finish makes it perfect for wearing under matte lipsticks, which I wear a lot. Get it here 🙂 The By Terry baume de rose is the fanciest lip balm ever, and one that I reserve exclusively for night time applications. It’s so creamy and it basically feels really luxurious. It’s the most unique formula I’ve seen in a lip product, it’s just so creamy and delicious. Mmm! I have a £5 Space NK card, which may soften the blow of buying another. Cheek wise, I have hit pan on NARS Luster, which is my favourite blusher for creating a peachy bronzey sculpted blow. I love this so much, I would recommend it to everyone if you want a glow. The colour doesn’t look the most exciting when you look at it, but it’s really something special on the cheeks. I wear this a lot, and I’ve still got loads left. MAC Soft and gentle is my favourite highlighter, and after almost daily use for so so long I can see a tiny glint of pan glinting through. Ooh, that sounded a bit rude… Soft and gentle is the nicest highlighter, it makes your skin look glowing and soft-focused. Have you ‘hit pan’ recently? p.s. Do you like the background today? Remember my name!